The Evenflo Vive Travel System - Just grab and go. A spontaneous adventure, perhaps a long walk in the park or a family vacation. The Vive's hassle free transfer from our stay-in-car base makes for a quick and safe connection. Ultra Slim 16", gravity fold/unfold fits any size vehicle from large to small. Our 4 point, 13" thick EVA wheels and front wheel shock adsorbing system provides increased stability, safety and comfort for your baby. 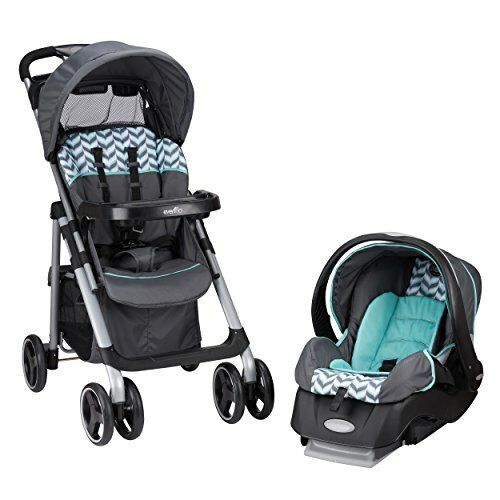 Paired with the Embrace Infant Car Seat, for an extended weight rating (4-35pound).